Click here for audio of Episode 593. Today, we resurrect a medieval engine of war -- and try not to kill anyone with it. The University of Houston's College of Engineering presents this series about the machines that make our civilization run, and the people whose ingenuity created them. The trebuchet was once a terrible weapon of war. The Chinese invented it, and the West picked it up in the 12th century. It's a gigantic counterweighted arm that slings missiles at the enemy. You don't see many trebuchets around anymore today. But now we stand in a pasture in Shropshire, England. A piano flies overhead and lands with a terrible crash a few hundred feet away. A few minutes later an automobile follows it. We're on Hew Kennedy's estate. Kennedy and a neighbor have built their own 30-ton trebuchet. "Why?" a reporter asks Kennedy. "Well, why not? It's bloody good fun!" he answers. Okay, forget rhyme and reason. Let's look at performance. The range for a grand piano is 125 yards. They can throw an upright 150 yards. They can throw a dead hog 175 yards and a 112-pound iron weight over 235 yards. Kennedy built his first trebuchet for a county fair many years ago. It was smaller. He threw toilets soaked in gasoline and set afire. The local paper praised "Those Magnificent Men and Their Flaming Latrines." Now local sportsmen want to don parachutes and ride Kennedy's trebuchet into the sky. The idea is seductive. He's made experiments with accelerometers. It seems that the trebuchet subjects its missile to about 20 Gs. Kennedy muses over the possibility. "It'd be splendid to throw a bloke -- really splendid," he says. Then, sadly, "He'd float down fine. But he'd float down dead." Kennedy's not the first post-medieval trebuchet maker. Cortez tried to build one for his siege of Mexico City. The first boulder he fired went straight up. It fell back to earth and destroyed the machine. Napoleon had one built as an academic exercise. It threw rocks backward. The technology sounds simple enough, but it's more complex than it seems. Kennedy succeeded where Cortez and Napoleon failed because he studied medieval sketches before he began. 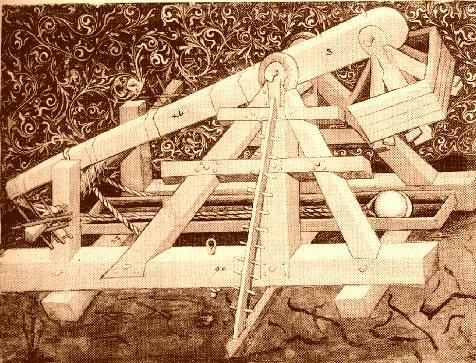 A sketch of a trebuchet throwing a stone gives you little sense of proportion. But Kennedy found a few sketches that showed trebuchets throwing dead horses. The rotting corpse of a horse in a castle under siege made a fine medieval form of biological warfare. So Kennedy scaled his trebuchet on the weight of a dead horse, and he got it right. And because he did, we finally get to watch this terrible medieval weapon -- flinging automobiles across a Shropshire meadow. Mapes, G., A Scud it's Not, But the Trebuchet Hurls a Mean Piano: Giant Medieval War Machine is Wowing British Farmers and Scaring the Sheep. The Wall Street Journal , Tuesday, July 30, 1991, pp. A1 & A10. Trebuchets that throw humans have also been built since then. One is shown at http://trebuchet.com/.